How the Allies kept the population of West Berlin alive in the face of a Russian blockade. In the summer of1948, the Russians occupied all of Eastern Europe. Behind Russian lines, the Allied-controlled part of the great city of Berlin stood as the lone Western outpost in a sea of Communist occupation. Then the Soviets closed all Allied traffic through their zone, sealing off the food and supply routes on which the city relied. A vast air armada streamed from Western airfields to supply the hard-pressed Berliners with food and necessities. For over a year the Americans led a giganticand successfuleffort to keep an entire city alive in the face of Soviet hostility. With strong insight into the characters of Ernest Bevin, General Clay, Dean Acheson, and Robert Schumann, and now with a foreword by former British minister to Berlin Sir Michael Burton, this a story of individual heroism and high brinkmanship politics, of daily life under appalling circumstances, and great achievements against all odds. Ann Tusa is the coauthor, along with her husband and writing partner John, of The Last Division and The Nuremberg Trial. She is a graduate of Cambridge University and lives in London, England. John Tusa is a former staff producer and managing director for the BBC and a winner the Royal Television Societys Journalist of the Year award. He is a graduate of Cambridge University, where he met his wife and writing partner, Ann. They live in London, England. Sir Michael Burton was British Minister in Berlin from 1985-1992. 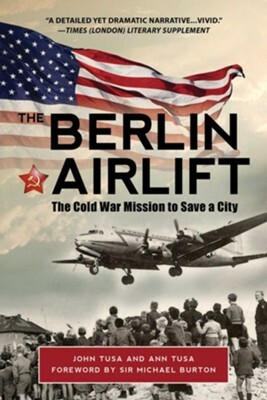 I'm the author/artist and I want to review Berlin Airlift.